Matt Pillischer and Shaun Ellis started out simply by sharing a love of folk, old-time music, vocal harmonies, and a social conscience. They formed High Hearts in 2005 to share that passion with others by way of performing both original songs and carefully selected covers. High Hearts’ music emerges from a long tradition of folk artists who deeply believed that by heightening personal, social, and political awareness, music can bring us together and change the world for the better. They also believe that, in a world of industrial homogeneity, there is value in the hand made and DIY approach. But most of all, they just have fun making music together. 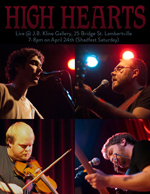 In 2009, High Hearts expanded to include John Coursey, on fiddle, and Justin Pope, on bass. Interestingly enough, John has been fixture on the east coast experimental music scene for many years and comes to the table of traditional music with a fresh set of ears. He has brought much to the group, enriching and modernizing the arrangements and giving a new voice to improvisational segments. Justin Pope has also been an invaluable addition to the band. Justin can just about do it all from singing, to songwriting, to recording, to playing just about any instrument imaginable (you should hear him on harmonica!). Justin has his own thriving solo career as a musician and is a major contributor to the New Hope area music scene. High Hearts play regularly in the Philadelphia, New York, Bucks County and Central New Jersey regions and have been featured on a number of local radio stations, including WPRB, WDVR, and WRSU.